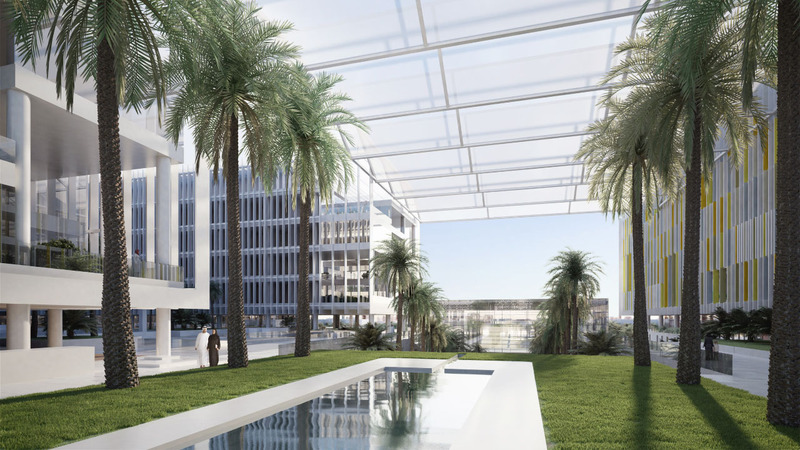 With sensitivity to Abu Dhabi’s local culture, climate, and architectural heritage, SOM designed a medical campus that creates a "city within a city." Visiting the hospital for any length of time can be a difficult experience for patients and their families, what with adjusting to new surroundings, being separated from loved ones, or just missing the familiarities of home. 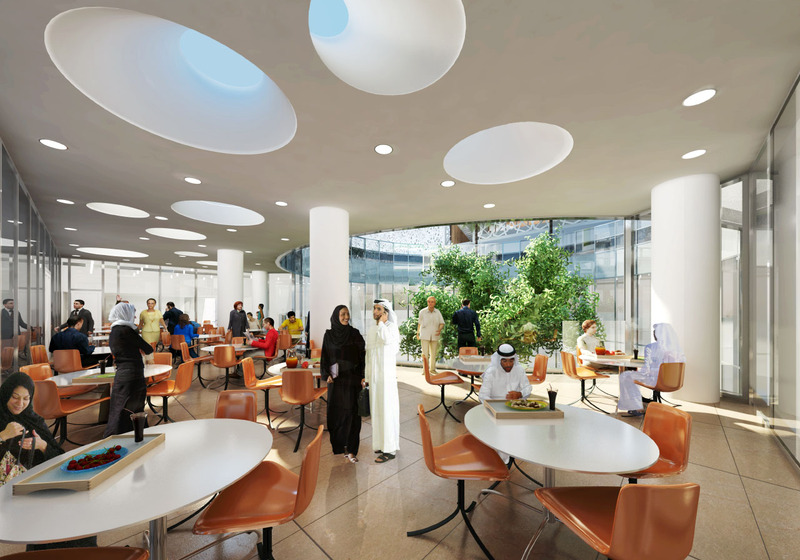 That is why the designers of the Sheikh Khalifa Medical City have put hospitality and psychological well-being at the forefront of their medical campus design. 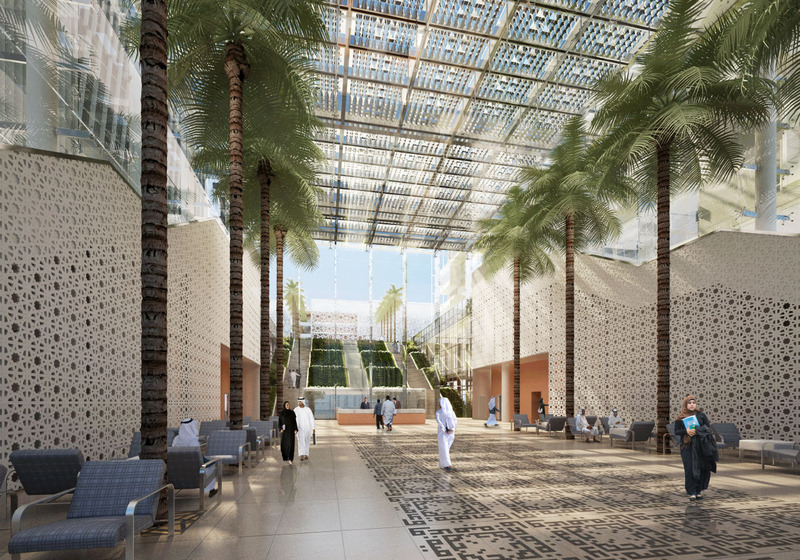 The 3 million square foot, 838-bed Sheikh Khalifa Medical City is a massive medical complex that was designed by Skidmore, Owings & Merrill LLP (SOM), an international architecture, interior design, engineering, and urban-planning firm. The project, which is a joint venture with ICME and Tilke, will replace the existing Sheikh Khalifa Medical City in Abu Dhabi. The new facility will be comprised of three hospitals and will provide pediatric, trauma, and extended medical services to Abu Dhabi residents and visitors. 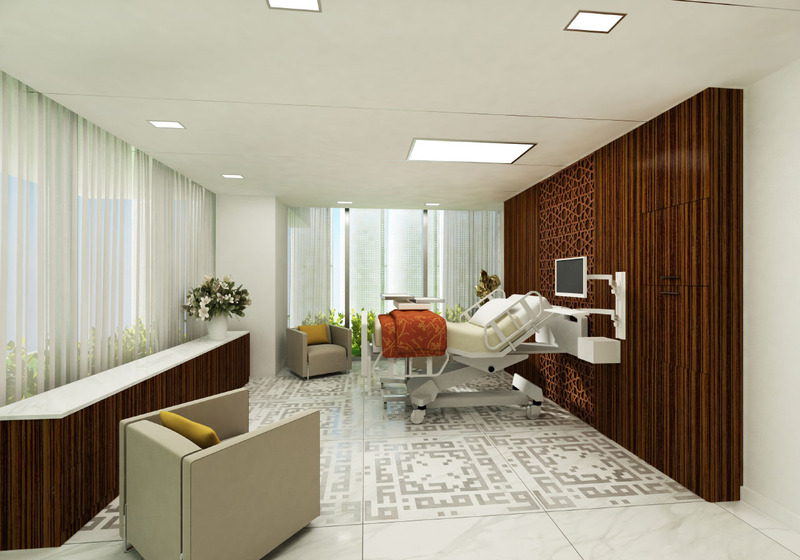 Based on the notion that patients should be treated like guests of the hospital, the medical facility will feature special amenities, such as retail stores, restaurants, cafes, indoor trees, courtyards and hanging gardens, to provide a tranquil experience for patients and their families and create a home-away-from-home atmosphere. Natural materials and diffused natural light will be utilized throughout the medical city – merging the facility’s interior with the surrounding landscape – to create a calm and relaxing environment for patients. 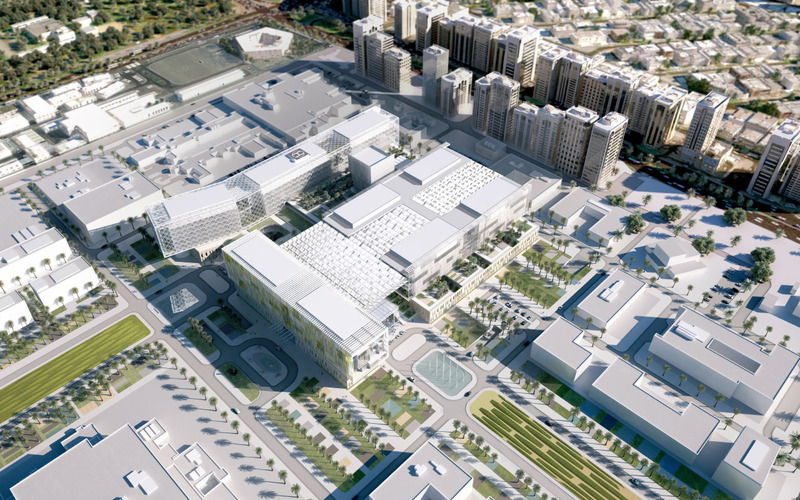 Because the Sheikh Khalifa Medical City will combine a general hospital, a trauma center, a women’s center, and a pediatric hospital, it may also make multiple family medical visits more convenient. 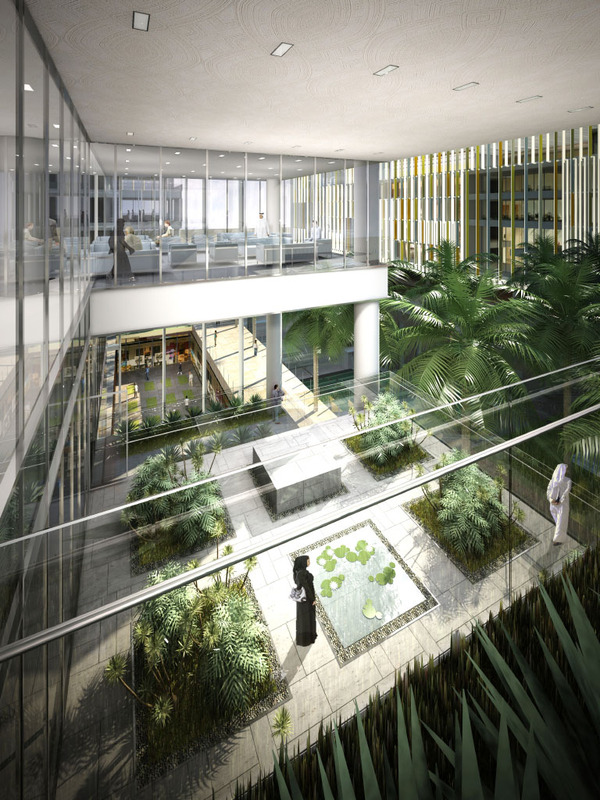 In addition to hospitality and patient psychological health, one of the primary design concerns of the project was creating a cohesive feeling between all of the units within the medical city, while also creating a sense of uniqueness and individuality for each unit, according to the SOM press release. To achieve this balance, SOM utilized both differentiating and unifying elements. Gardens will be strategically placed throughout the medical city to create a sense of cohesiveness. A two-story stone plinth (a reference to the region’s historic architecture) will be a common feature throughout the medical city, shared by all three hospitals. The first floor of the plinth will consist of a women’s urgent care center, pediatric and adult emergency departments, all outpatient departments, and a diagnostic center for all departments. The second floor of the plinth will house intensive care units and inpatient and day surgery centers. Many of the special hospitality amenities are located at the center of the plinth, serving as a multi-level common area for all hospital patients and employees to enjoy, regardless of in which hospital they are staying. Each hospital then divides into completely separate units above the plinth. Each hospital unit will feature exterior sun screens – a unifying component – but every sun screen will showcase a design that reflects the individuality of that particular hospital. 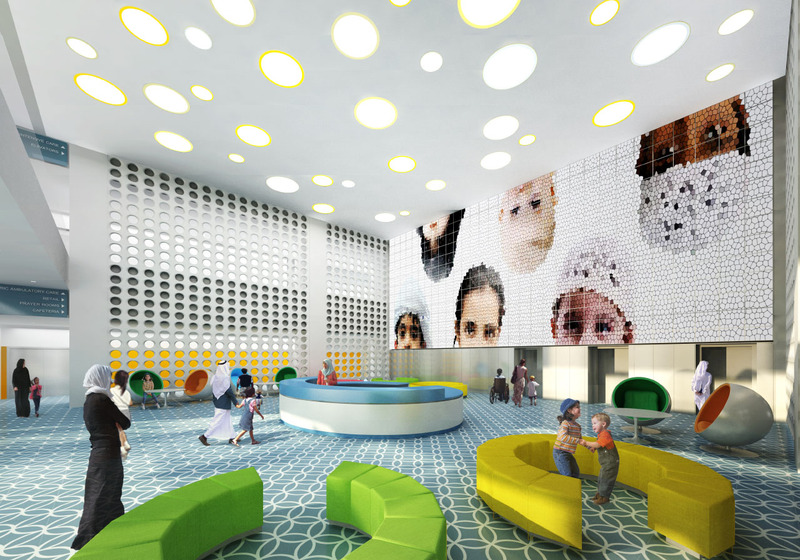 For example, exterior sun screens on the women’s hospital will feature elaborate geometric designs inspired by mashrabiya (an element of traditional Arabic architecture), while the children’s hospital’s sun screens will feature bright, colorful, organic patterns. The incorporation of multiple public spaces and natural garden settings, along with the sheer size of the hospitals, has essentially created a “city within a city,” according to the SOM press release. It is hoped that the character of the complex will be similar to that of a university campus and will create a real sense of community. 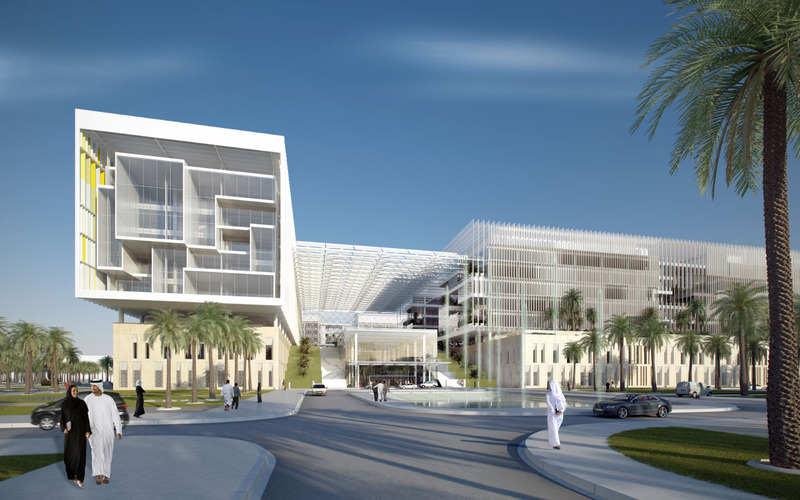 Construction on the Sheikh Khalifa Medical City will begin in 2013.